The teachings of His Holiness Orgyen Kusum Lingpa, recently published at the Tibetan Printing House in Chengdu, China, in a new 30 volume edition, are a wondrous treasury of transmissions directly from the mind of Padma Sambhava, Guru Rinpoche, dedicated to protecting and serving the needs of beings in these most challenging times. One 400-page volume of this treasury is dedicated to the meditation deity who is the embodiment of pro-active, compassionate wisdom, known as Amoghapasa. There are short, medium and elaborate forms of empowerment; an elaborate ‘heart essence’ sadhana; and a wide range of related practices and rituals for compassionate activity based on this deity, including a range of special rituals for benefiting the deceased. Wherever he went, His Holiness emphasized that the practice of Amoghapasa was one of his primary gifts to us, to pacify our disturbed mentality and create personal and social harmony. To fulfill this directive from his precious root guru, Tulku Sherdor, His Holiness’ heart disciple, has begun to spread this practice by teaching the short daily sadhana practice, offering the concise empowerment, and leading practice groups online. Tulku Sherdor now feels the groundwork has been laid to go deeper into this practice, which constitutes a complete path to enlightenment. In this program he will offer the full length empowerment ritual and other transmissions, and explain the short daily sadhana practice in depth. 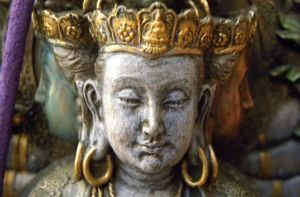 Therefore, this program is open to and suitable for those who simply wish to receive the blessing and inspiration of connecting with the wisdom transmissions of his Holiness, a completely realized master; for those with some prior connection to the practice and to Tulku Sherdor; and for those with greater experience who wish to delve further. Please note that in the spirit of bodhicitta and as an offering to the lineage, the dharma, and all of us, Tulku Sherdor has requested that there be no registration fee for this program. At the conclusion you may make a gift in support of this precious activity in accordance with your own means and dedication to the path of Mahayana dharma, the great way to enlightenment.